Small-flowered Marica or Red Garlic (Eleutherine plicata) bulbs. 獨腳絲茅的球根. Tropical flowering bulb/herb. Easy to grow. Best growing in full sun to partial shade location. Small fragrant white flowers in spring and fall. Long blooming time! Flowers only bloom in the evening. Bulbs have reddish color. USDA Zones:9-11. Mature size: 1′-1.5′(H) X 3″-6′(W). 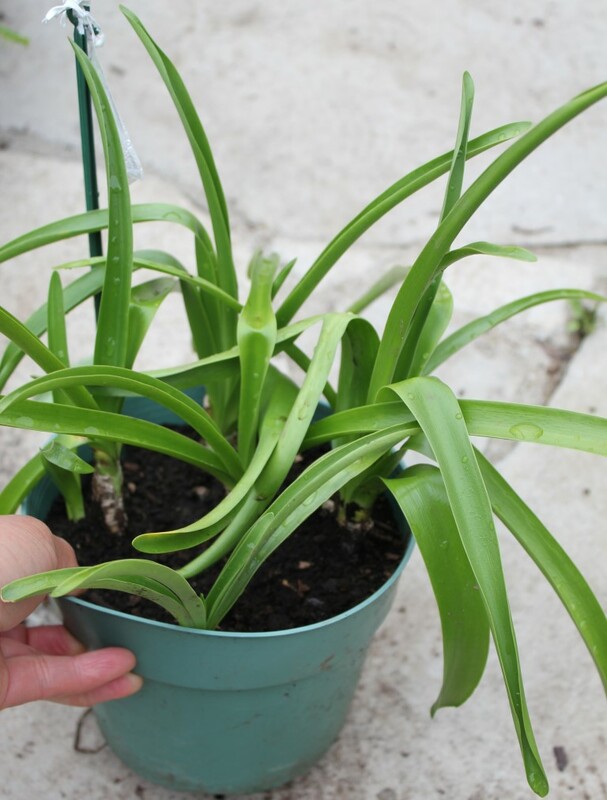 Propagate by bulbs, offsets or division. Medicinal. 熱帶開花球根/藥草. 容易栽種. 最好栽種在全日照到半日照處. 春到秋開白色芳香的小白花. 花期很長! 花頗吸引蜂蝶. 花僅於夜間盛開. 球根紅色. 喜熱不耐寒. 成熟株高1-1.5呎,寬幅3-6吋. 繁殖以球根,側芽或分株的方式來進行. 藥用. Candycane Sorrel (Oxalis versicolor) flowers are so cute! 冰淇淋酢漿草的花真是小巧可愛! Candycane Sorrel (Oxalis versicolor) flower in full bloom.冰淇淋酢漿草的花全開的樣子. Candycane Sorrel (Oxalis versicolor) foliage and flower bud. 冰淇淋酢漿草的葉片與花苞. Candycane Sorrel (Oxalis versicolor) flower is about to bloom.冰淇淋酢漿草的花快盛開了. Tropical small flowering bulb. Perennial. Easy to grow. Best growing in full sun to partial shade location. Small white flowers in winter to early summer. Under side of the flowers with red edging, from the bottom of the bloom looks like candy, hence the name. Flowers attract bees and butterflies. USDA Zones:7-9. Mature size:6″-1′(H) X 9″-1′(W). Propagate by rhisomes, bulbs, corms, cuttings or division. Suitable in containers indoors or alpine garden. 熱帶小型開花球根. 多年生. 容易栽種. 最好栽種在全日照到半日照處. 冬天到初夏開白色單瓣的小花. 花的背面有紅色瓣緣,全開時從花底下看如同糖果,又像冰淇淋甜筒的螺紋,故ˋ名. 花頗吸引蜂蝶. 喜熱不甚耐寒. 成熟株高6吋到1呎,寬幅9吋到1呎. 繁殖方式以地下莖,球根,小球,扦插或分株的方式來進行. 適合室內靠窗盆植或高山型花園栽種. Martagon Lily (Lilium martagon) in fall. Martagon lily has unique foliage surround the stem.秋天的歐洲百合/頭巾百合. 歐洲百合有著獨特的圍著莖幹的輪狀葉. Hardy bulbous perennial. Easy to grow. Best growing in full sun to partial shade location. White or deep pink/red flowers in late spring to mid summer, flowers face downwards. Flowers attract bees and butterflies. USDA Zones:3-10. Mature size:3′-4′(H) X 9″-1.5′(W). Propagate by seeds, offsets, bulbs, corms or division. 強健的多年生球根花卉. 容易栽種. 最好栽種在全日照到半日照處. 花色白或粉紅/紅色從春末開到仲夏時節,花面相下開. 花頗吸引蜂蝶. 極其耐寒耐熱. 成熟株高3-4呎,寬幅9吋到1.5呎. 繁殖以種子,側芽,球根,子球或分株等方式來進行. Flower image see links below. Resurrection Lily(Lycoris squamigera) bulbs. 鹿蔥/夏水仙/紫花石蒜的球根. Hardy bulbous perennial. Easy to grow. Best growing in full sun location. Its beautiful , fragrant, large pink flowers bloom in mid summer to early fall. Flowers are good for cutting. Suitable growing indoors in containers. USDA Zones:5-11. Mature size:1′-1.5′(H) X 3″-6″(W). Propagate by bulbs, offsets and division. Toxic if ingested. Animals like to eat them so you might want to use chicken wire to protect the bulbs! 強健的多年生球根花卉. 容易栽種. 最好栽種在全日照處. 仲夏到初秋開美麗.大朵,芳香的粉色花. 花很適合做切花花材. 它也很適合室內盆植. 喜熱也耐寒. 成熟株高1-1.5呎,寬幅僅3-6吋. 以球根,側芽或分株方式來進行繁殖. 對人類是有毒的,勿食. 但動物喜食它,所以種它要做好防護措施! Nerine (Nerine bowdenii) is blooming! Flowers in soft pink. 納麗石蒜開花了! 有著嬌柔的粉色花. Nerine (Nerine bowdenii) growing seeds in fall. 納麗石蒜秋天結子中. Nerine (Nerine bowdenii) seeds germinate easily. 納麗石蒜種子容易發芽結球. Nerine before flowers appear. (Nerine bowdenii) 納麗石蒜裝草,尚未來花的樣子. Also called Bowden lily. Native in South Africa. Easy to grow and propagate. Easy to grow in full sun to partial shade location. These tender perennial flowering bulbs flower in mid summer to fall with deep pink flowers. Flowers attract bees and butterflies. USDA Zones:7-10. Mature size:1.5′-2′(H) X 6″(W). Propagate by seeds, bulbs, offsets and division. 納麗石算是原生南非的多年生球根花卉. 容易栽種及繁殖. 容易栽種在全日照到半日照處. 仲夏間到秋天開粉紅色花. 花頗吸引蜂蝶. 喜熱不甚耐寒. 成熟株高1.5-2呎,寬幅約6吋. 繁殖以種子,球根,側芽(球)以及分株的方式來進行. Beautiful bulbous perennial. Easy to grow. Best growing in full sun to partial shade location but also tolerant light shade. Small deep blue flowers in flower ball in spring. Flowers attract bees and butterflies. Good for cut flower. USDA Zones:7-10. Mature size:6″-1′(H) X 3″-6″(W). Plant is toxic if ingested. Propagate by seeds, bulb or division. 美麗的多年生球根花卉. 容易栽種. 最好栽種在全日照到半日照處但也能生長於散光處. 小朵深藍色小花聚成的花球於春天盛開. 花吸引蜂蝶. 也適合為插花的花材. 喜熱不甚耐寒. 成熟株高6吋到1呎,寬幅3-6吋. 植株全株有毒勿食. 繁殖以種子,球根或分株方式來進行. It has unusual spider legs thin flower petals, quite different in its pretty way! 🙂 How do you like this variety?